Acknowledged author Michael Kutner wrote Applied Linear Regression Models- 4th Edition with Student CD (McGraw Hill/Irwin Series: Operations and Decision Sciences) comprising 701 pages back in 2004. Textbook and etextbook are published under ISBN 0073014664 and 9780073014661. Since then Applied Linear Regression Models- 4th Edition with Student CD (McGraw Hill/Irwin Series: Operations and Decision Sciences) textbook received total rating of 4 stars and was available to sell back to BooksRun online for the top buyback price of $58.30 or rent at the marketplace. 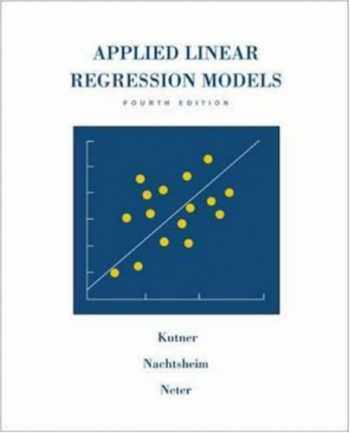 Kutner, Nachtsheim, Neter, Wasserman, Applied Linear Regression Models, 4/e (ALRM4e) is the long established leading authoritative text and reference on regression (previously Neter was lead author.) For students in most any discipline where statistical analysis or interpretation is used, ALRM has served as the industry standard. The text includes brief introductory and review material, and then proceeds through regression and modeling. All topics are presented in a precise and clear style supported with solved examples, numbered formulae, graphic illustrations, and "Comments" to provide depth and statistical accuracy and precision. Applications used within the text and the hallmark problems, exercises, and projects are drawn from virtually all disciplines and fields providing motivation for students in any discipline. ALRM 4e provides an increased use of computing and graphical analysis throughout, without sacrificing concepts or rigor.